I go through several duffle bags each year, discarding those that don't quite work for me and losing one or two to baggage handler-induced trauma. As aggravating as it is to have my stuff destroyed by the idiots I am paying to take care of it, I've never been too bent out of shape about it because few of those bags lived up to my expectations. But I will be devastated if something happens to my latest acquisition — Blackhawk's Medium A.L.E.R.T. Bag. The Medium A.L.E.R.T. Bag has all the features I demand in a travel bag. Quality wheels; a retractable handle; and rugged, 1,000 denier nylon construction with reinforced stitching are all standard. The 6,720 cubic inch bag is big enough to handle all the gear I need for all but the most extreme cold weather hunts. 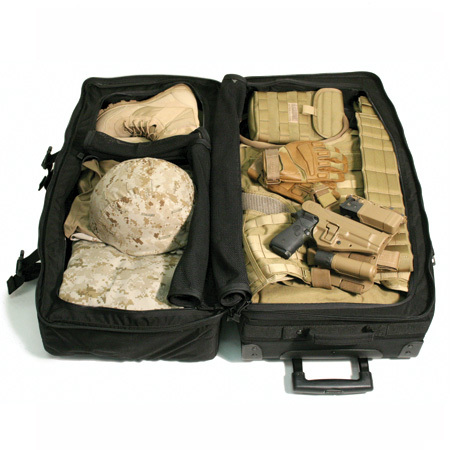 The Blackhawk bag has a top and bottom section. The bottom half has a rigid bottom and a mesh top that allows you to see the contents of the bag when you unfold it. The top half has two pockets, both of which have mesh bottoms so you can see the contents of those when you open the bag. The smaller pocket, which is located on top of the upright bag, may also be accessed from the outside. The two halves are held together with a rugged, lockable zipper and two compression straps. I've taken my Medium A.L.E.R.T. Bag on three overseas trips now — two to Africa and one to Argentina. It has held up to the rigors of third world baggage handling very well. In fact, it still looks band new. And I am just as impressed with its size, layout and features as I was when I ordered it off the Blackhawk web site.